Some dogs and cats have a smoking problem: they live in a house with someone who smokes. So in a way, they become smokers, too. Secondhand smoke causes more than 41,000 human deaths each year and contributes to lung cancer, heart disease, respiratory infections and asthma. While few studies exist on the effects of secondhand smoke in pets, dogs and cats do suffer similar health consequences. In fact, research shows that living in a house with a smoker can boost the risk of nasal and lung cancer in dogs and lymphoid and oral cancer in cats. Pets can sponge up nicotine and tobacco smoke in several ways. When cigarette or cigar smoke is exhaled into the air, dogs and cats inhale it in the form of secondhand smoke, which contains hundreds of carcinogenic or toxic chemicals. They can also be affected by thirdhand smoke, or the residue from tobacco smoke that forms a layer on the skin, clothing, carpeting and upholstery within the home — even in the pet’s fur. That smoky scent you notice in a hotel room from a previous smoker? That’s thirdhand smoke, and it can remain in the environment for months after a person kicks the habit. 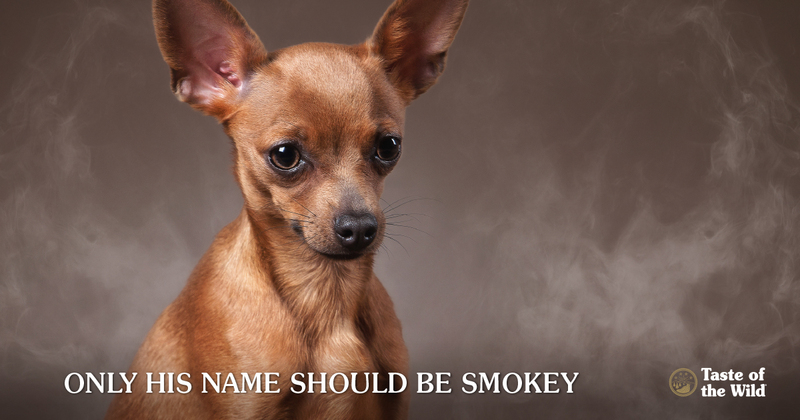 Pets can swallow chemicals from thirdhand smoke when they lick their owners, their environment or during grooming. Because dogs and cats are often near the floor, where residues collect in carpets and dust, they can absorb these chemicals through the skin or by inhaling contaminated dust. Pets can also get nicotine poisoning if they eat cigarettes, chewing tobacco, nicotine gum or patches, or liquid nicotine in electronic cigarette refill cartridges. Studies show dogs exposed to tobacco smoke in their homes had a higher risk of cancer than those living in smoke-free homes — and the more packs smoked, the greater the risk of cancer. But what you might not expect is that the type of cancer appears to be influenced by the length of the dogs’ noses, according to a Colorado State University study. Those with longer noses, such as greyhounds and collies, tended to experience nasal and sinus cancer, while short-nosed dogs such as pugs and bulldogs were more likely to have lung cancer. This suggests that the longer noses may trap harmful chemicals inside the nose, while the shorter noses may allow more of these chemicals to reach the lungs. In another study, cats in smoking households were more than twice as likely to develop lymphoma, a malignant cancer of the lymphoid tissue than cats in non-smoking homes. Cats with five or more years of secondhand smoke exposure were more than three times likely to develop lymphoma. There may also be a link between squamous cell carcinoma, an aggressive oral cancer in cats, and exposure to cigarette smoke. This makes sense when you consider that most cats are fastidious groomers, and they may ingest smoke residue from their fur during daily cleaning sessions. Curious pets in smoking households can also accidentally eat cigars, cigarettes, nicotine gum and patches, which can contain toxic levels of nicotine. Eating a single cigarette, which can contain 9 to 30 mg of nicotine, can be deadly to some animals, given that the fatal dose for nicotine for dogs and cats is approximately 20 to 100 mg. Nicotine gum can also contain xylitol, an artificial sweetener that can lead to life-threatening drops blood sugar and liver failure in dogs. While many people consider e-cigarettes to be safe, the liquid in the cartridges may contain even higher concentrations of nicotine than cigarettes and the liquid form may be absorbed more quickly. Many e-cigarettes also contain sweet flavorings, which make them even more appealing to pets. But there’s good news, too: Almost 30 percent of pet owners who smoke said that knowing the dangers of secondhand smoke to their pets could prompt them to extinguish those butts once and for all. RELATED POST: Should You Buy Pet Health Insurance?